Please Welcome New Employee Austin Rotert! 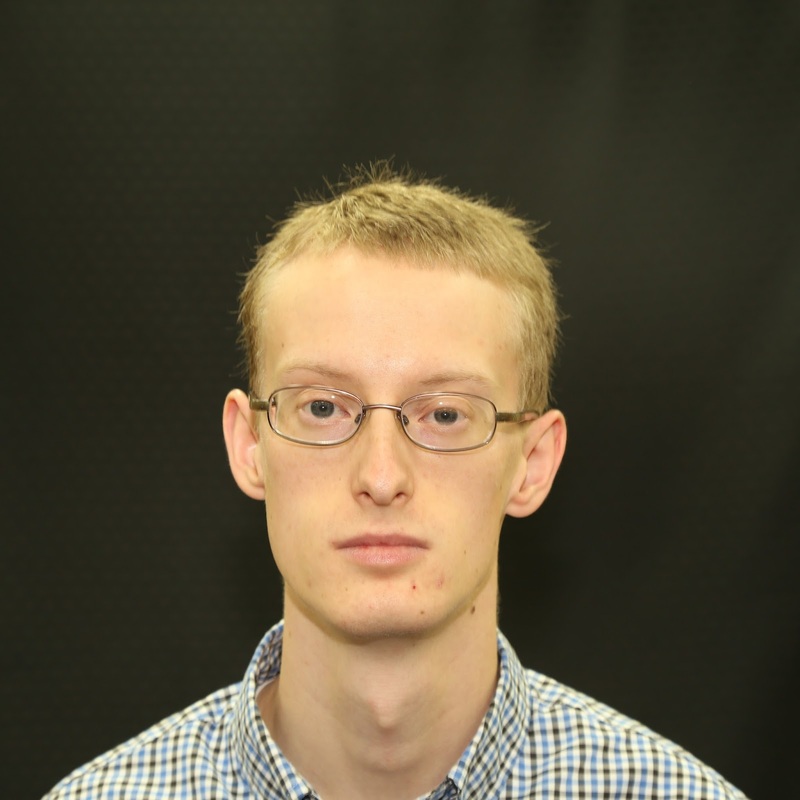 Austin Rotert has recently joined BIT as a Software Developer. Originally from Spearfish, South Dakota he attended college at the South Dakota School of Mines and Technology where he majored in Computer Science and minored in Math. 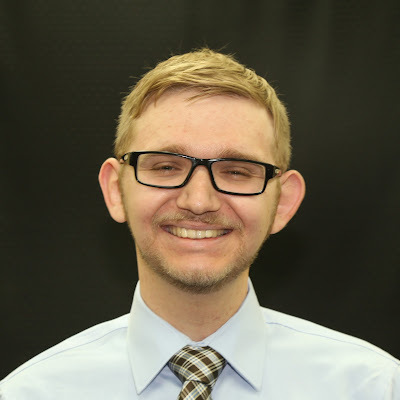 In his free time, Austin enjoys playing PC and tabletop games with friends, working on small programming projects at home, geocaching with his wife, and raising his newborn daughter. Welcome to BIT, Austin! We are excited to have you here! Please Welcome New Employee Benjamin Morken! Benjamin Morken has recently joined BIT as a Software Developer. Originally from Mitchell, South Dakota, Benjamin has also lived in Oakdale, Minnesota- which he attributes to being a life-long Twins and Vikings fan. Benjamin attended South Dakota State University where he majored in Computer Science and minored in Math. Prior to working for BIT, Benjamin worked at Daktronics as a Student Software Developer. He is most looking forward to continuing to learn, expand, and improve on his coding skills and practices- along with picking up on a few new and improved skills! In Benjamin’s free time, he enjoys hunting, fishing, playing video games with friends, and hanging out with friends and family. Welcome to BIT, Benjamin! We are lucky to have you! Please Welcome New Employee Rachel Sundstrom! Rachel Sundstrom has recently joined BIT as a Business Analyst. Originally from Howard, Rachel moved to Pierre in 2000. Rachel attended school at South Dakota State University where she majored in Microbiology. Prior to working at BIT, Rachel was a Laboratory Information Management System (LIMS) Administrator for the South Dakota Department of Health for the past 6 years. Prior to that, Rachel worked as a medical microbiologist. Welcome to BIT, Rachel! We are excited to have you! Please Welcome New Employee Benjamin Kaiser! Benjamin Kaiser recently joined the BIT Development Team 4 as a Software Engineer. Originally from Cheyenne, Wyoming, Benjamin attended school at the South Dakota School of Mines and Technology where he majored in Computer Science. 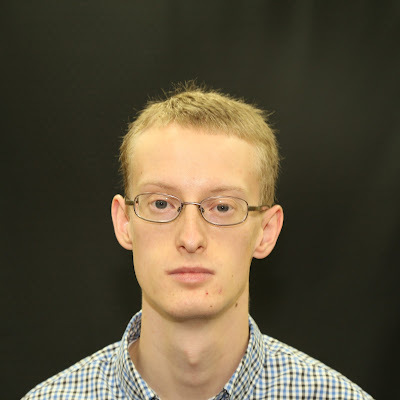 Prior to working for BIT, Benjamin interned at Golden West Telecommunications in Rapid City where he focused on software development for an internal web portal application. Welcome to BIT, Benjamin! We are excited to have you! Please Welcome New Employee Chance Haka! Chance recently joined BIT as a Software Engineer Intern for BIT. He was born and raised in Fort Pierre and attended High School at Stanley County. He is currently majoring in Computer Science with a minor in mathematics at the South Dakota School of Mines and Technology. Chance is scheduled to graduate in December of this year! While working for BIT, Chance looks forward to contributing to projects being facilitated by the State and then later seeing these projects work by helping or being used by other South Dakotans. Welcome to BIT, Chance! We are excited to have you! In March of 2016, Deanne Booth was appointed Director of BIT Development. She recognized a need for change within BIT so that Development could become more common, consistent, and uniform across all six teams. In order to make all of the practices consistent, Development first needed to define and document the existing processes. Deanne chose to start with one of the most core processes for Development – the Software Development Life Cycle (SDLC). The SDLC is a map of what each project goes through starting with the request sent by an agency and ending with implementation in a production environment. Creating this baseline definition of the SDLC highlighted even more how inconsistent practices were, not only across the different development teams, but even within each of the teams. 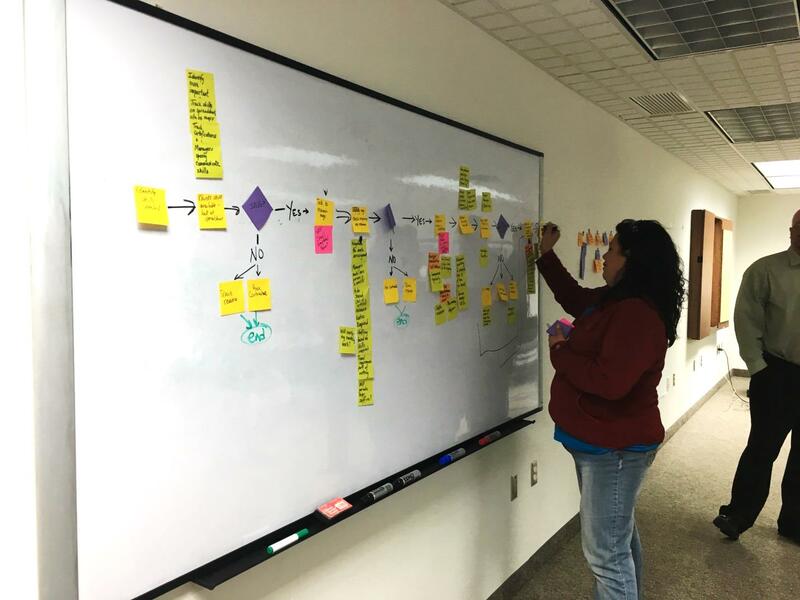 In July, a small group from Development met with Lean practitioners from Daktronics, USD, and the Black Hills Corporation to gain more insight into the Lean process improvement and how each entity had adopted Lean into their organizations. Lean is a process improvement system that was developed originally by Toyota. While Lean first appeared in automotive factories, the software development industry has been quickly adopting Lean methodologies. The goal of Lean is to provide what is needed when it is needed to the customer with minimal waste. Using Lean tools when analyzing processes can help identify weaknesses and wastes. Lean practices encourage asking the question “Why?” repeatedly when performing analyses. In this way, Lean does not blame people for mistakes, but instead identifies what failures in the process allowed the mistakes to happen in the first place so that the process can be improved. In August, 2016, Ally Shepardson and Becky Degen came to Pierre to teach a one-day Lean introductory course to BIT leadership and those interested in learning more about Lean. BIT Development took part in their first Lean kaizen event facilitated by Ally Shepardson in September. Kaizen is the Japanese word for “continuous improvement” and a kaizen event is a short, focused effort to improve a specific process within the scope of the participants. After going through and vetting a few possible process improvement ideas, the team chose to focus the kaizen event on the Initial Estimate process. When an agency has an I/T need, a project proposal is submitted to BIT Development through the IT Priorities system. That agency’s Development manager then reviews the request and assigns someone to gather more information about the project and provide an initial estimate. The accuracy of an initial estimate affects the agency’s budgeting, the project’s funding and timeline, and Development managers’ resource planning. The kaizen group included BIT Development managers, software engineers, and agency personnel. In October, Deanne was given funding for BIT Development to learn more about and explore Lean from the Legislative Research Council. ReEngine, a Six Sigma consultant company, was hired to help Development improve their processes. The ReEngine consultants came to Pierre and performed an intensive week-long training with BIT Development managers, a few volunteer software engineers, and three agency representatives from the Department of Revenue. During this training, the consultants helped Development build a Throughput Operating Strategy (TOS) and identify key tools that will help reach the division’s goals. ReEngine takes an approach to process improvement by combining Lean with Six Sigma, a method that focuses on statistics and attempts to reduce variation in order to increase quality, morale, and performance. In the following months, ReEngine worked with Development to tackle three additional Lean projects. The first project with ReEngine, which started at the beginning of November 2016, was to create a Takt Board. A Takt Board provides visibility of all of the projects that Development is working on and what phase of the SDLC each project is in. This interactive visual provides managers with insight into their projects’ progression, anticipate when projects will be completed, plan when to introduce new projects into the flow, and recognize when issues arise that are preventing projects from progressing through the SDLC. At Ally’s suggestion, BIT Development started a Lean Book Club in also in November. The first book the group tackled was Creating A Lean Culture by David Mann. The group meets every other week to discuss a chapter and incorporate work on action items taken from the book club discussion. “Action items” are ideas for improvement that can be acted on right away. Between projects, ReEngine assisted Development with creating Value Stream Maps for all of the SDLC phases. Value Stream Mapping is the process of breaking apart each step in an SDLC phase and examining it to determine if that step adds value, enables value, or does not add value, and an estimate of how long it takes to complete that step. The purpose of the exercise was to determine if the time spent on a step is equal to the resulting value and to recognize where waste may be occurring. In January 2017, the second project with ReEngine, centered on Requirements Gathering, embarked. As the group delved into this event, they realized that every team was collecting requirements for a project entirely different which caused the event’s scope to become complicated and bloated. Thus, the group was told that a common, consistent, uniform process that every Development team will use should be established. The group switched focus to incorporating Microsoft’s Team Foundation Server (TFS) and how to use that system to input and track requirements. Using TFS, requirements for a project are entered directly into an electronic backlog as work items, which are then prioritized and broken down into tasks. TFS allows the project team to visualize the work in progress and provides insight to managers and agency stakeholders to a project’s transition through the SDLC. The final project with ReEngine, center around Resource Sharing, which began in March of 2017, attempted to tackle a larger issue with Development’s culture. Too often, agencies have a narrowed view of what Development can accomplish for them. This skewed perception is inherited from years of only working with their designated Development Team’s resources. In order for us to truly offer the best products possible, we would like all of the agencies to have access to all of the skills available across development teams so that we can assure that every project has the best resources possible dedicated to its success. The Resource Sharing kaizen focused on the process of sharing resources across teams and how to assure that teams and managers have an open and comfortable flow of people and skills as needed. “It was the best meeting I’ve ever attended. We got a lot of work done and had a great time!” Alan Coots said of the event. In order to carry on Development’s Continuous Improvement efforts, three new positions were added to the repertoire – a Continuous Improvement Facilitator, Continuous Improvement Project Operations, and Data Metrics and Analysis . The focus of these positions is to spearhead future opportunities for change, plan and execute continuous improvement events, help managers, developers and analysts alike try to accomplish more with less effort, and capture and utilize consistent metrics throughout Development. These new positions will help increase everyone in BIT Development’s knowledge of Lean by offering small introductory Lean trainings, scheduling additional Book Clubs for those who are interested, and offering other Software Engineers the opportunity to participate in and run kaizen events. Going forward, Development is planning on applying Lean tools and methodologies to the SDLC and other internal processes to streamline them and help employees do more work with less effort. Over time, every process will be revisited to ensure we are continually improving to keep up with changing needs, technologies, and best industry practices. So here’s to BIT Development for recognizing the need for improvement in an ever-changing field, and to Deanne, our fearless leader, for pushing us to improve by moving one piece of cheese at a time. Deanne Booth with Alfredo Mycue and David Johnson of ReEngine. Aske Whitebird, Development’s Continuous Improvement Project Manager, working with the Resource Sharing kaizen group to map out their sharing process. Please Welcome New Employee Justin Soderstrom! Justin Soderstrom recently joined BIT as a Software Engineer for Development Team 1. Justin was originally born in Baltimore, Maryland but has lived all over the United States in places such as Texas, Alaska, and Michigan! Justin originally attended the University of Alaska Fairbanks (UAF), but transferred to Dakota State University after the fall of his sophomore year. At DSU, he earned a B.S. in Computer Science and an A.S. in Network and Computer Security. Prior to working for BIT, Justin had an internship at Johns Hopkins Applied Physics Lab (JHUAPL) where he wrote software that assisted various projects for the Asymmetric Operations Sector (AOS) of the laboratory. Welcome to BIT, Justin! We are happy to have you!